Last time I wrote an intro post about creating memorable characters. Today, I want to chat about the heart of what makes a character memorable and/compelling. The Arc. First of all, what is a character Arc? A Revised Character has an ARC, but that revision can take three different forms. b. A Growth – this is when the character doesn't necessarily have a full change, but overcomes his/her insecurities or fears to become a stronger person by the end. A lot of novels use this type of arc, particularly romances. Darcy and Lizzie are examples of this. Aragorn overcomes his fears to become King of Gondor. Peter Pevensie only shifts into a stronger character, but doesn't really change. Harry Potter would probably fit into this one as well as Captain America (although is has a physical change, his good heart is still very much the same). c. A Fall – This character changes for the worst, or does not find fulfillment in the story. It is probably considered a Tragedy. Michael Corleone from The Godfather might be considered a ‘fall’ character. Glen Close in Dangerous Lliasons. Kurtz in Heart of Darkness and Gregor Samsa from Franz Kafka’s novel, The Metamorphosis. I will make a quick mention here that there are some fine characters in books that do not change, and I’m going to use this to segue into how characters influence each others’ change. Particularly in romance. Characters who do not have a strong arc, are usually GREAT influences on the arc of someone else in the story. In the case of Gandalf, he is the mentor and influencer of both Bilbo and Frodo, but at his core, he doesn't really change or grow. Michael Hauge says that a character arc is taking a character from his identity in the beginning of the story and moving him to his essence by the end. His identity is what he wants the world to see. His essence is who he truly is. What makes Jane Eyre compelling is Jane’s influence on the change which happens in Rochester. Michael Hauge refers to this as one character helping the other bring out his/her essence. 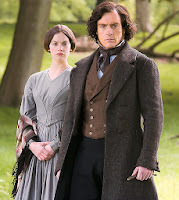 Edward Rochester and Jane Eyre are very much alike. Next week, I’ll go through the 9 traits of a memorable character and show you how Edward meets each one of them, but for now I want to focus on how he is transformed by Jane. More than anyone else, she connects with him at the heart level. At the level of the man he truly is. Because of this connection, it brings out in him the man he wants to be but is afraid to reveal. Because of his wounds and the betrayal of his father, he’d donned a protective ‘identity’ of a philandering, wealthy man without a care. Even in a few of his private interactions he presents as a harsh, unfeeling person....but his actions speak a whole lot louder to his true nature. This persona protected his secret and his wounds. 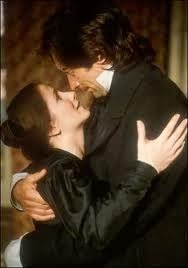 Jane’s subdued passion, quiet strength, hunger for knowledge, honesty, and goodness attract him at his core. There is even a part in the novel/movie where Rochester talks about how similar they are. Jane sees the hero in him and helps him regain part of that man by the end of the novel. He’s still endearingly ruthless and crass, but by the end of the novel the reader sees what Jane has seen all along. A hero within. That’s the power romances can have with Character Arc. It's why P & P is so beautiful! Without Lizzie's changing view, the reader wouldn't have seen the stellar attributes of Fitzwilliam Darcy as Lizzie discovered them. Lizzie's and Darcy’s growth influence each other. They both gain a new perspective. They both overcome their pride and their prejudices. What type of character arc are you writing? If you are writing a romance, have you thought of ways that your hero and heroine can influence change in each other? Great post, Pepper! You could be a teacher of literature!! Thank for your kind words, Sue. Awesome stuff, Pepper. Definitely not to teachy. :) Got me thinking hard about characters in my upcoming book! Thanks, Melissa. I love to consider the workings of characters on each other. It makes me think of how God uses people in our own lives as sandpaper and refiners. Sometimes it takes someone else 'seeing' us as God sees us, to remind us of who we really are. Good stuff. It has me analyzing my characters right now.